A sire's career typically hinges on his first 2-year-olds, no matter what the initial market opinion was of the horse when he first entered stud. Occasionally that first crop vaults a stallion from obscurity (Malibu Moon, for example), but more often the opposite happens when the first crop fails to meet expectations. 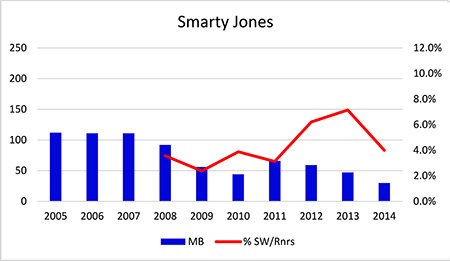 Smarty Jones entered stud for $100,000 as the champion 3-year-old colt of 2004. He bred 112 mares his first season and led all first-year stallions with a 4.31 CI of mares bred in 2005. He posted similar numbers in his subsequent crops until his runners hit the track in 2008. With only one stakes winner from 28 runners, his book quality and size began to decline. Smarty Jones relocated to Pennsylvania in 2011 and had a 50% increase in the number of mares bred. While he has recently increased his stakes winner percentage, he has averaged only 110 starters per year since 2008. While not a champion, Corinthian boasted a very strong pedigree and had recorded wins in the Metropolitan Handicap (gr. I) and inaugural Breeders' Cup Dirt Mile when he entered stud in 2008. He stood for $40,000, the co-third highest entering fee after Kentucky Derby Presented by Yum! Brands (gr.I) winner Street Sense ($75,000) and Derby runner-up Hard Spun ($50,000). 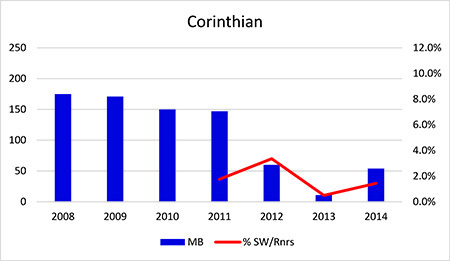 Corinthian received strong support from breeders with 643 mares bred in his first four seasons, but after his first crop of 2-year-olds failed to impress with only one stakes winner and no graded stakes wins, his numbers declined sharply by -59% from his fourth to fifth seasons. 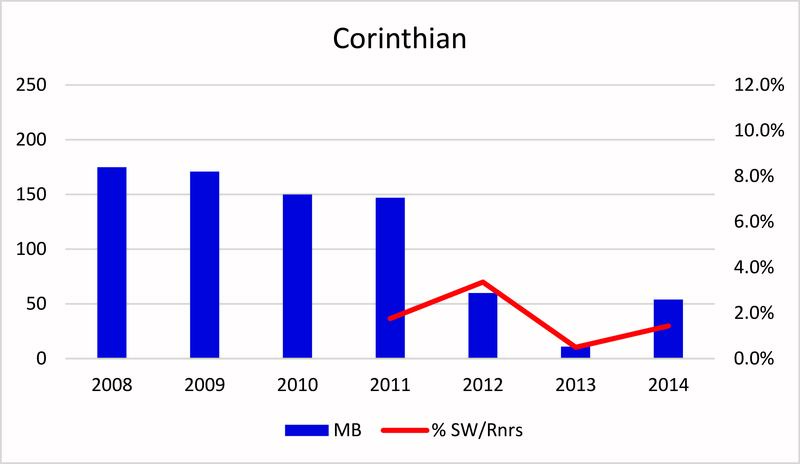 Like Smarty Jones, Corinthian's numbers improved after he was relocated to Pin Oak Lane Farm in Pennsylvania for the 2014 breeding season. 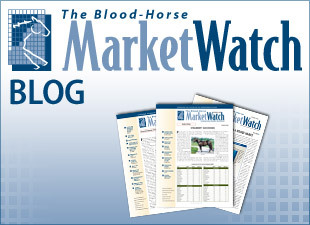 He stood for $4,000 and covered 54 mares, a 391% increase over his 2013 book. 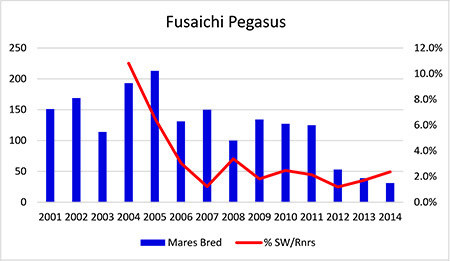 Fusaichi Pegasus entered stud for $150,000 after winning the Kentucky Derby in 2000. Adding to his value as a stallion prospect was the promise of becoming the next great heir to his recently deceased champion sire Mr. Prospector, who had died in 1999. 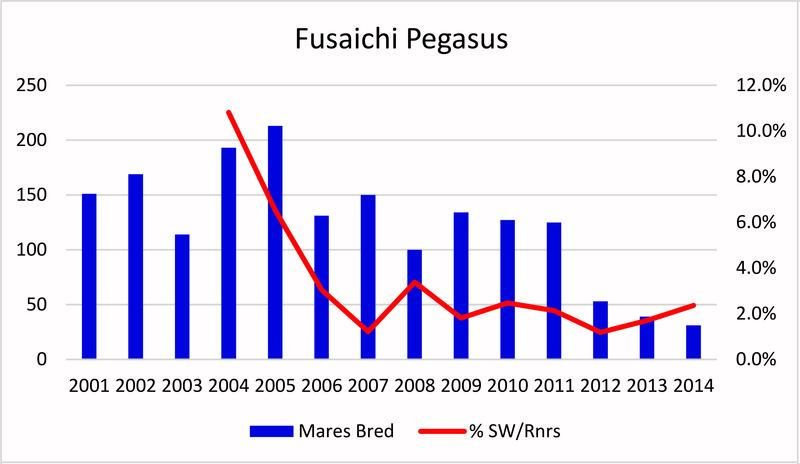 Covering more than 150 mares in each of his first two seasons, Fusaichi Pegasus had a slight lull in his third year at stud. However, his book increased by 69% in 2004 following a strong yearling sales season in which his North American yearlings averaged $329,095. After finishing third on the first-crop sires list with six stakes winners and two graded winners, his 2005 book increased to 213, his largest book to date. But his runners proved to be less consistent as 3-year-olds and as his percentage of stakes winners declined, so did his book size. He stood for $7,500 in 2014 and his yearlings averaged $20,440 from five sold. 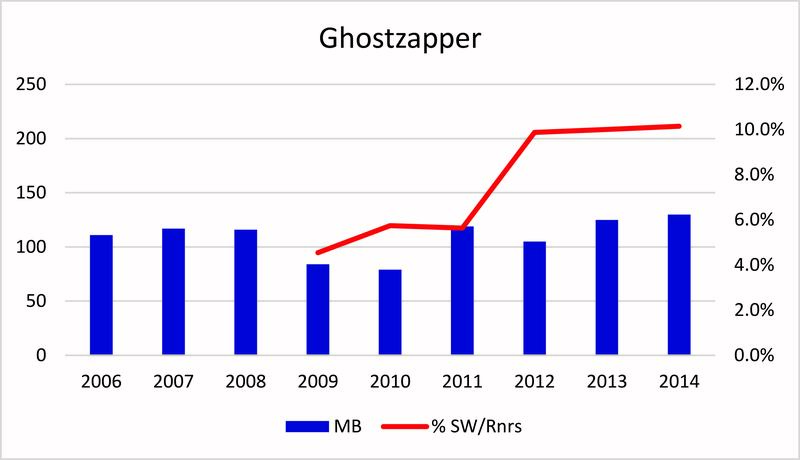 Ghostzapper appeared to be following a similar decline after his first 2-year-olds debuted. After setting a North American record with an entering fee of $200,000, Ghostzapper sired only one stakes winner and no graded stakes winners as a freshman sire in 2009. He bred a career-low 79 mares in 2010. However, Ghostzapper's runners showed more promise as they matured, and after a sophomore season with two graded stakes horses, including grade I winner Stately Victor, Ghostzapper's book increased by 51%. During the past two years he has sired 10% stakes winners from runners, and he covered 130 mares in 2014 at a fee of $50,000.